Published on December 31, 2008	in Crafty, Quilting and Sewing. 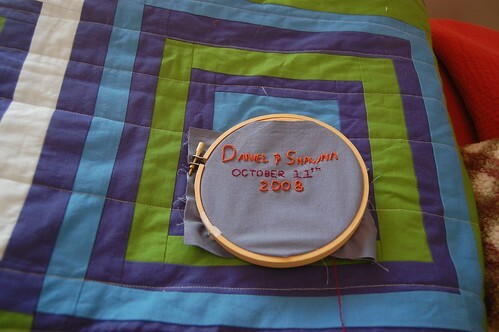 3 Comments Tags: d&s wedding quilt, denyse schmidt, drunk love, quilt, Quilting, wedding gift. We managed to finish the wedding quilt for n’s brother in time to take it across the country with us at Christmas (only 2.5 months after the wedding itself!). I spent an entire day working on it in December, first sewing the blocks together to make the quilt top, piecing the back together, and binding it together. It took another couple of hours to do the machine quilting and sew the binding on with the machine before we were ready to pack it (in a carry-on!) to bring with us. We finished the hand sewing of the binding in MD and I embroidered a patch with the names of the bride and groom and their wedding date. 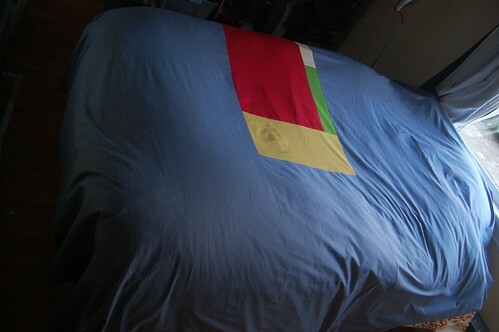 I hung the quilt top in my window while I was trying to find sufficient light for photographs. 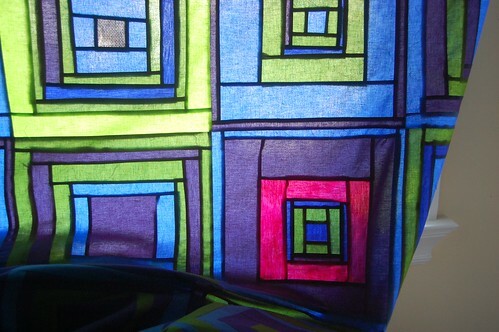 It reminds me of stained glass and makes me want to sew pieced curtains someday. The back. It is made mostly of a gray blue (delft blue kona cotton to be exact) with one pieced section. The light was not agreeing with me that day, it made me miss our old apartment. Almost finished, nighttime shot. 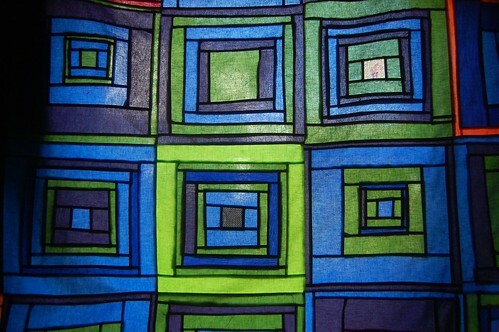 You can see the machine quilting here, I did straight lines again. I found it much easier doing the machine quilting this time around. I don’t know if it was because I used a different batting, but it was substantially easier. I thought about doing squares in each of the blocks, but I was under time constraints and I had done the lines before so I decided to stick with what I know. 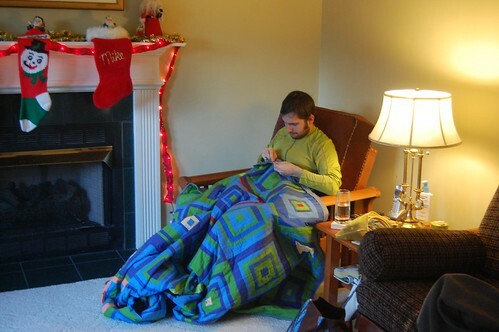 I think for the next quilt I would like to try free motion quilting. My mediocre attempts at embroidery. Nick helps with sewing the binding to the back. I feel so relieved having this done! Just to remind you about the details, pattern is a modified version of “Drunk Love Two-Tone” from the Denyse Schmidt Quilts book. 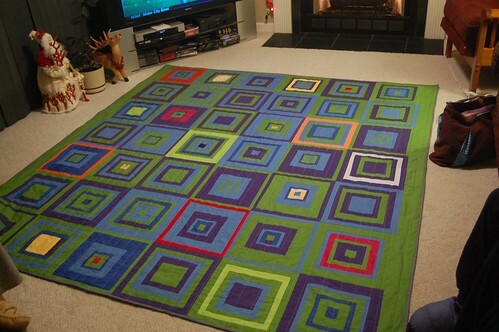 We did 6 by 7 blocks with a small (3″) border of green on two sides. See the full progress here and all of the photos here. Your quilt is beautiful. What a labor of love! I hope it was received with great excitement. This is such an amazing quilt! I love the colors that you used and that label is so cute. I’m sure it will be cherished for many years! Okay, I guess I was totally confused. 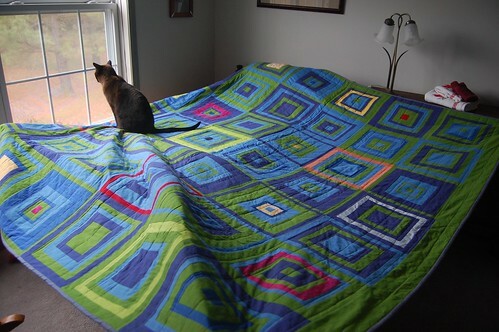 You did make this quilt too…….it isn’t the original from the book by Denise Schmidt. My head is reeling , but I was confused trying to figure out why everyone had used sashing between the blocks on “what a bunch of squares”, when THIS is the pattern I’m wanting to make. I think I’ve figured it all out now.